On the given stage of motorization level development and increase of traffic flow intensity, with increasing frequency apply to the implementation of intelligent automated systems of traffic control. The quality of their work depends foremost from study of the primary factors of road users, their behavior, including the factor of a person as movement operator, geometric parameters of communication routes, road conditions as movement environment. Such study is held by methods of field research, documentary research and mathematical modelling. Considering transport system, it is necessary to have in mind that we are concerned with the large array of stochastic indicators which, during its normal operation, comply with the normal law of distribution. If the process of traffic flows movement control, including their attachment to the roadway, parameters of which are clearly regulated by standards, is studied relatively in detail, then regularities in pedestrian flows are underexplored only due to the fact that their behavior quite frequently is regulated. However, enough amounts of mathematical methods of description the different stochastic systems have appeared, based on which it is possible to perform the simulation of road users’ behavior, in particular pedestrians. In this work it is undertaken experimental research on pedestrians’ behavior on signaled pedestrian crossings in Lviv city for different functional zones and in different time of day, and also it is investigated dynamic factors in traffic flow with the aim of determination the rational (by duration) regimes of traffic light control, during which the amount and duration of delays in traffic flows and the possibility of accidents commission is reduced, which are the consequence of road users behavior. The backgrounds of these negative phenomena are: fluctuation of traffic flow intensity, when pedestrian during longtime restrictive signals can start to move on restrictive signal of traffic light, what is unexpected for vehicle driver, especially in nighttime when blinding appears; observation only the demands of normative documents during designing the communication routes what is not always adequate for different functional areas of settlements; absence of distinct regulation of range of traffic light control parameters which would create its optimal regimes considering traffic and pedestrian flows behavior. P. G. Buga, Organizatsiya peshehodnogo dvizheniya v gorodah [Organization of pedestrian movement in cities]. Moscow, Russia: Vysshaya shkola Publ., 1980. [in Russian]. A. S. Havaev, “Analiz povedeniya peshehodov pri peresechenii proezzhey chasti” [“Analysis of the behaviour of pedestrians crossing the roadway”], Organization and road safety: Proceedings of the VII All-Russian scientific and practical conference, Tyumen, Russia, April 4, 2014, pp. 62-65. [in Russian]. D. Klebelsberg, Transportnaya psihologiya [Transport psychology]. Moscow, Russia: Transport Publ., 1989. [in Russian]. E. M. Lobanov, Transportnaya planirovka gorodov [Transport urban planning]. Moscow, Russia: Transport Publ., 1990. [in Russian]. Ju. D. Shelkov, Orhanyzatsyia dorozhnoho dvyzhenyia v horodakh [Organization of road traffic in cities]. Moscow, Russia: Transport Publ., 1995. [in Russian]. Ju. A. Vrubel', Poteri v dorozhnom dvizhenii [Losses in road traffic]. Minsk, Bilorus: BNTU Publ., 2003. [in Russian]. G. I. Klinkovshteyn, Organizatsiya dorozhnogo dvizheniya [Traffic Organization]. Moscow, Russia: Transport Publ., 2001. [in Russian]. S. Teply, D.I. Allingham, D.B. Richardson, and B.W. Stephenson, Canadian Capacity Guide for Signalized Intersections. Toronto: Institute of Transportation Engineers, 2008. V. M. Kysliakov, V. V. Filippov, and I. Ya. Shkoliarenko, Matematycheskoe modelyrovanye y otsenka uslovyi dvyzhenyia avtomobylei i peshokhodov [Mathematical modelling and assessment of the conditions of movement of cars and pedestrians]. Moscow, Russia: Transport Publ., 1979. [in Russian]. R. Pretty, “The delay to pedestrians and vehicles at signalized intersection”, ITE Journal, vol. 49, no. 5, pp. 20-23, 1979. Highway Capacity Manual. Washington, DC: TRB Publ, 2000. Svitlofory dorozhni. Zahalni tekhnichni vymohy, pravyla zastosovuvannia ta vymohy bezpeky [Traffic lights. General technical requirements, application rules and safety requirements], DSTU 4092–02, 2002. [in Ukrainian]. Bezpeka dorozhnoho rukhu. Avtomobilni dorohy, vulytsi ta zaliznychni pereizdy [Road safety. Roads, streets and railroad crossings], DSTU 3587–97, 1997. [in Ukrainian]. Avtomobilni dorohy [Roads], DBN 2.3-4:2007, 2007. [in Ukrainian]. Mistobuduvannia. Planuvannia i zabudova miskykh i silskykh poselen [Town planning. Planning and building of urban and rural settlements], DBN 360–92, 2002. [in Ukrainian]. V. A. Cherepanov, Transport v gradostroytelstve [Transport in town planning]. Moscow, Russia: Transport Publ., 1964. [in Russian]. M. S. Fishelson, Transportnaia planyrovka horodov [Transportation planning of cities]. Moscow, Russia: Vysshaya shkola Publ., 1985. [in Russian]. V. G. Sosiants, D. S. Samoilov, and V. A. Yudyn, Bezopasnost dvyzhenyia na horodskom transporte [Safety of traffic on urban transport]. Moscow, Russia: Transport Publ., 1964. [in Russian]. V. A. Vladymyrov, “Vopros orhanyzatsyy dvyzhenyia” [“Questions of traffic organization”], Munitcipalnaia Ekonomika Moskvy [Municipal economy of Moscow], no. 2. pp. 11-13, 1963. [in Russian]. F. V. Webster, and B. M. Cobbe, “Traffic Signals”, in Road Research Technical Paper No. 56, London, UK: HMSQ Publ., 1966. A. G. Levashev, Proektirovanie reguliruemyih peresecheniy [Designing adjustable intersections]. Irkutsk, Russia: IrGTU Publ., 2016. [in Russian]. Yu. A. Kremenets, M. P. Pecherskyi, and M. B. Afanasev, Tekhnycheskye sredstva orhanyzatsyy dorozhnoho dvyzhenyia: uchebnyk dlia vuzov [Technical means of traffic management: a textbook for universities]. Moscow, Russia: Transport Publ., 2005. [in Russian]. V. G. Zhyvohliadov, Teoryia dvyzhenyia transportnykh y peshekhodnykh potokov [Theory of traffic and pedestrian flows]. Rostov-na-Donu, Russia: Izvestiya vuzov. Severo-Kavkazskiy region, 2005. [in Russian]. Yu. 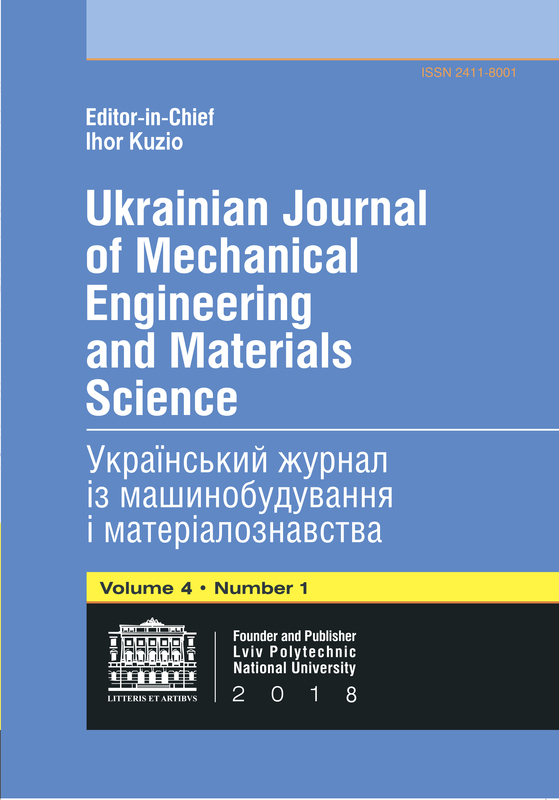 Royko, O. Hrytsun, R. Bura, "Choose of optimal regimes of traffic light control in operating zone of pedestrian crossing", Ukrainian Journal of Mechanical Engineering and Materials Science, vol. 4, no. 1, pp. 144-159, 2018.